The incorrect handling of heavy and awkward loads causes accidents which can result in staff being off work for some time. The photo above shows how to lift heavy items in the correct way. 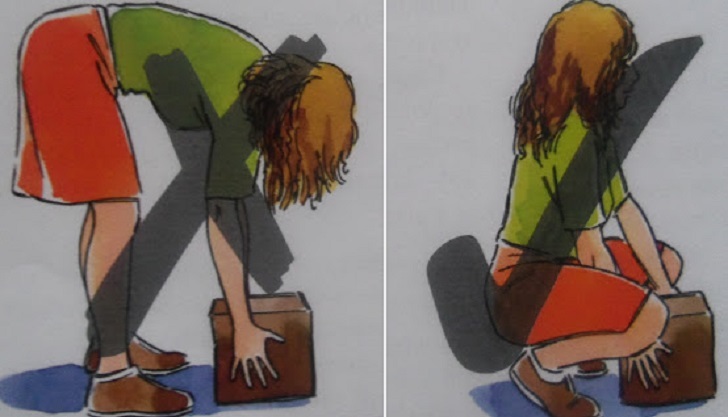 The safest way to lift items is to bend at the knees rather than bending the back. Strain and damage can be reduced if two people do the lifting rather that one. ➧When goods are moved on trolleys or any wheeled vehicles, they should be loaded carefully (not overloaded) and in a manner that enables the handler to see where they are going. ➧In stores, it is essential that heavy items are stacked at the bottom and that steps are used with care. Particular care is needed when large pots are moved containing liquid, especially hot liquid. They should not be filled to the brim. ➧A warning sign that equipment handles, lids etc. can be hot should be given, this can be indicated by a small sprinkle of flour or something similar. ➧Extra care is needed when taking a tray from the oven or salamander so that the tray does not burn someone else.